The suit is working well. The inflow stream is working well. I’m not a delicate lady. Everything is normal on board. I’m taking up the initial position. 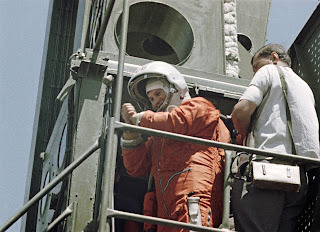 Valentina Tereskova preparing for launch. This is a poem made by selecting and rearranging words from a segment of conversation in the transcript of Valentina Tereshkova's epic orbit of the Earth in 1963. So in a way we are joint authors of this work. Note also the influence of Gertrude Stein.